Among the most tremendous, the most fantastic exploits that two acrobats can show, one places of at the top of the list of the figures realized balance on a head. The balances on hands fit into numerous disciplines but purest expression is when it substitutes itself in the most classic of hand-to-hand. Finally, triple somersault in flying trapeze was accessible to much more than an acrobat who wanted to reach it. But balance on a head, this incredible column of two bodies in one hand to the head without their eyes meeting; not more than one tandem by generation can reach it. This Las Vegas Hand Balancing Act is comprised of World Class professionals who have reached it. One is a native of Ukraine, where he graduated from "Kiev State Circus College". He has begun his career in 1991 at the National Circus of Ukraine with his hand to hand balancing act. In 1993 having won first place at the New Ukrainian Circus Festival, in 1994 he has received the offer from famous Nikulin's Moscow circus to continue the career in Russia. Being a member of The Union of State Circuses and the performer of Nikulin's Moscow circus he toured Japan (1995) and France (1996) showing off his amazing hand balancing act. After moving to the United States in 1996 he has performed with Cirque De La Mer at Sea World in California, Florida and Montreal, Canada. Some of his awards include 3rd place at Sarasota International Circus Festival and Parade in 1998. The other member of this Las Vegas Hand Balancing Act was born in Russia where he began to train his hand balancing act since 1988. At the age of 14 he has already received the rank "Master of Sports of the International class". Being a member of the Russian National Team he represented with honor his country in the World and European Championships in Belgium, Poland, The Czech Republic, Argentina, Netherlands and the United States. During his competitive years he became the Twice World Champion (1999, 2000), the Champion of the Europe (1999) and Six Time Gold Medalist in such kind of sports acrobatics as Man's pairs hand to hand balancing. In 2000 owing to his sports talents the second members of this Las Vegas Hand Balancing Act got an opportunity to begin his career in Cirque Du Soleil, in their show Varekai ("Russian Swings" act). He performed with Varekai through Canada and the United States until 2003. After moving to the United States he joined to the Cirque Productions in Florida in 2003. During 2 years he performed solo act "Hand balancing on canes". From October 2005 these World Class performers became the partners: one is the head porter and the other is the carried. 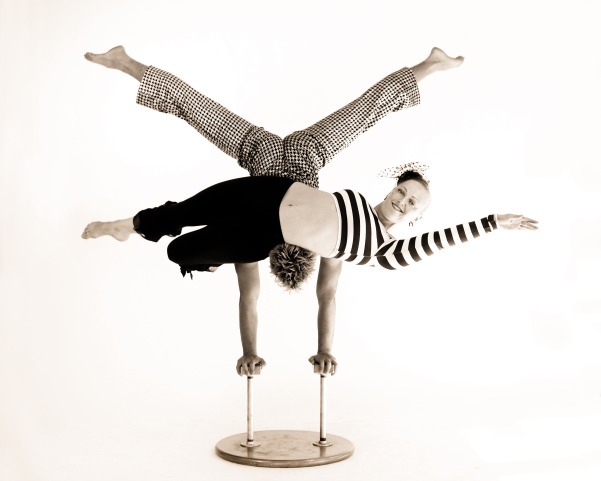 This Las Vegas Hand Balancing Act is the combination of highly professionalism and artistry. This is act of strength, emotions, slow motions, which set to their own music. This really incredible hand to hand balancing act on the complexity amazes with ease with which these two performers execute it. The Las Vegas Hand Balancing Act is almost world exclusivity.